Oats are not only versatile, but also contain nutritional benefits. One of the main reasons that I reach for oats multiple times a week is because they are a good source of fiber and help support a healthy digestive system. We all know that when you are regular, you feel good. A huge component of digestive health is fiber intake. Fiber can be found in fruits, vegetables, and whole grains. For healthy individuals, the ideal range of dietary fiber is 25g to 38g per day. Oats are a good source of dietary fiber and provide 4g per 1/2 cup serving. 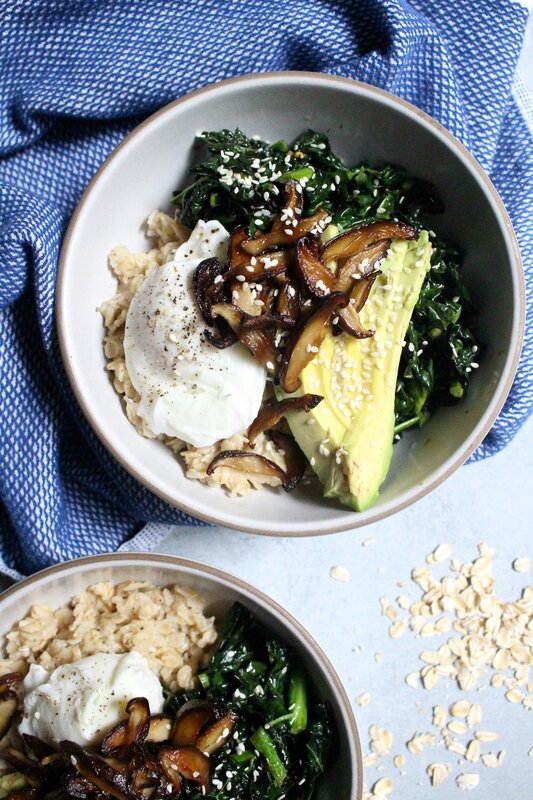 Rethink your oat game and consider substituting them in your savory grain bowls for a different take on a classic grain. To learn more about the benefits of oats head to Quakeroats.com . Preheat oven to 400 degrees. On a parchment paper-lined sheet tray, toss shiitake mushrooms with coconut aminos or tamari and olive oil. Spread mushrooms out evenly, and bake for 30 minutes, turning frequently until crispy. Pay close attention to the oven as mushrooms can go from perfect to burned quickly. Mushrooms will continue to crisp when removed from the oven. As the mushrooms cook, make the oats. Bring 1 3/4 cups water and a pinch of salt to a boil. Add oats, reduce heat to low, simmer and cook for 5 minutes until liquid is absorbed and oats are tender. To make the kale, warm olive oil in a large skillet over medium heat. Add garlic and chili flakes and cook for 1 minute. Add the kale and cook until wilted, about 4 minutes. Finish with 1 tablespoon coconut aminos or tamari. Transfer to a bowl and set aside. For the poached eggs, bring a large saucepan of salted water to a gentle simmer. Crack an egg into a small bowl. Stir simmering water with a slotted spoon to make a gentle whirlpool. Tip egg out of bowl into center of whirlpool and swirl water gently to help bring whites up around the yolk. Repeat with additional egg. Cook until whites are just set but yolk is still soft, about 2½ to 3 minutes. Using a slotted spoon, transfer eggs to a paper towel-lined warm plate. To serve, spoon oats into two bowls. Divide the kale and shiitake bacon between the bowls. 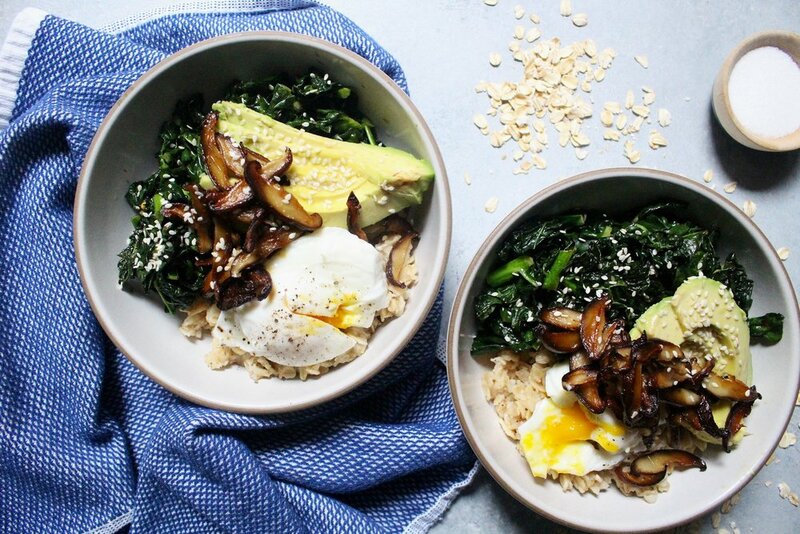 Top each bowl with a poached egg, avocado slices, and a sprinkling of sesame seeds.